We’ve all made this joking reference before to fatty fast foods that we love, but that are less than healthy to consume. Regular readers of the Allen School Online Blog know that we love to cover stories about horrible fast foods. From KFC’s gruesome Double Down sandwich to the greasy McDonald’s McGriddle breakfast sandwich. As entrants into the field of medical office assisting, you’re bound to endure a lifetime of dealing with people who suffer the maleffects of eating this kind of diet. 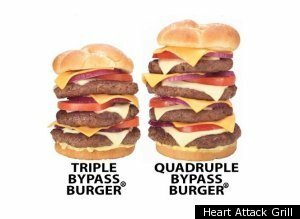 Just look at the case of the man that suffered a heart attack while eating something called the “Triple Bypass Burger” (see photo) at a place in Las Vegas known as the Heart Attack Grill. You may be as disgusted as I was to learn that this 8000 calorie monstrosity of a sandwich is not the largest one on their menu (see the Quadruple Bypass Burger to be truly impressed/repulsed). So yes, the victim in this story did indeed suffer a heart attack while eating a Triple Bypass Burger at the Heart Attack Grill. Is anyone surprised? Always looking for stories about horrible dietary abuses so if you know of any places or stories like this one, please share with me in the comments. Now go eat a spinach salad! Happy Friday students!